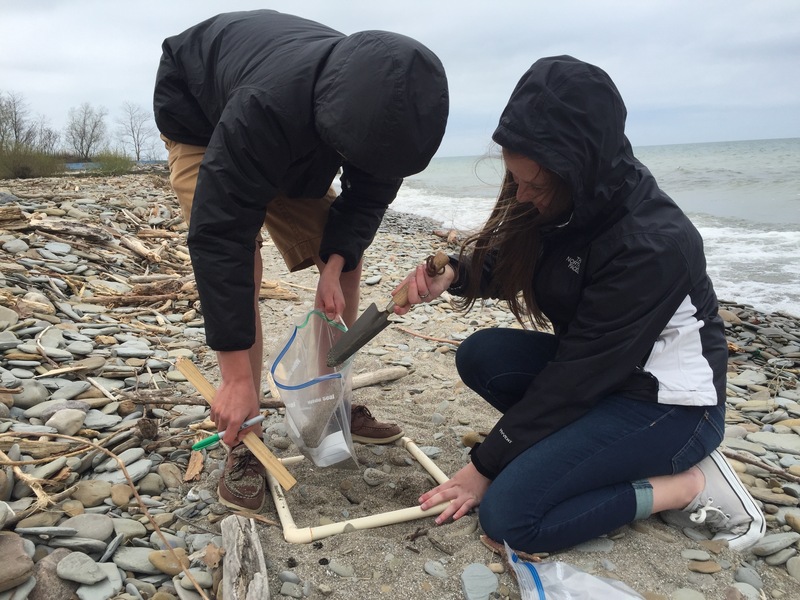 As part of a Center for Great Lakes partnership with local educators Fairview High School students used a protocol developed by the University of Florida to investigate microplastic pollution at Avonia Beach. Becca Turner’s students have been researching the issue of plastic pollution in Lake Erie and were interested in finding out how much plastic is on the beach closest to their school. They did a beach cleanup, noting what types of trash they picked up, and then collected multiple sand samples which they took back to school. They allowed the sand to dry over the weekend and then sieved their samples to remove sand and stones. Students looked at debris under stereoscopes and microscopes, teasing out small pieces of shell and other natural materials. They will share their data with other local high school students and with the University of Florida. They will also provide comments on how to modify the protocol for freshwater sampling. Pennsylvania Sea Grant works with educators and students from around the Great Lakes basin through the Center for Great Lakes Literacy, a partnership between the Great Lakes Sea Grant Network and the U.S. E.P.A. Fore more information contact Marti Martz.